McCain the Maverick: Myth, or reality? “If Republicans had forgotten that Sen. John McCain used to be America’s most famous political maverick,” said Steven T. Dennis in Bloomberg.com, “they just got a reminder.” The war hero staged a stinging rebuke of his own party last week when, with an “emphatic thumbs down,” he cast the deciding vote against his party’s Obamacare repeal bill—dooming the GOP’s tortured effort to repeal Obamacare for the foreseeable future. McCain “has defied his party before,” said Lauren Fox in CNN.com. But McCain’s theatrical repeal rebellion “may be one of his most memorable moments.” With a prominent surgical scar over his left eyebrow, the 80-year-old left a hospital bed in Arizona to deliver “an epic 15-minute speech that rattled the conscience of the body”—rebuking Senate colleagues for turning their back on problem-solving and bipartisan compromise. 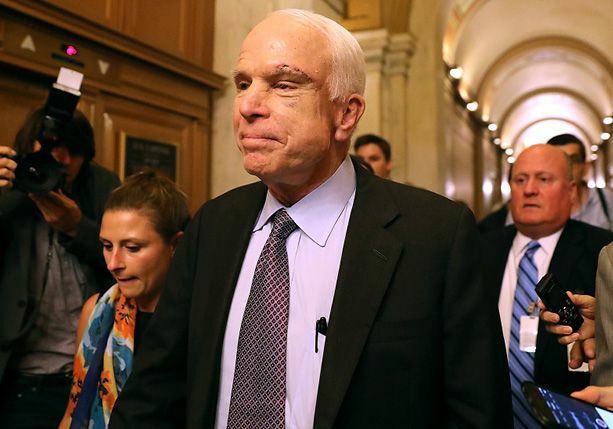 “We’re getting nothing done, my friends,” said McCain, who is being treated for a brain tumor.